It’s a tale as old as time: man loves sweet new truck, man drives truck off a jump, relatively stock truck breaks on impact. 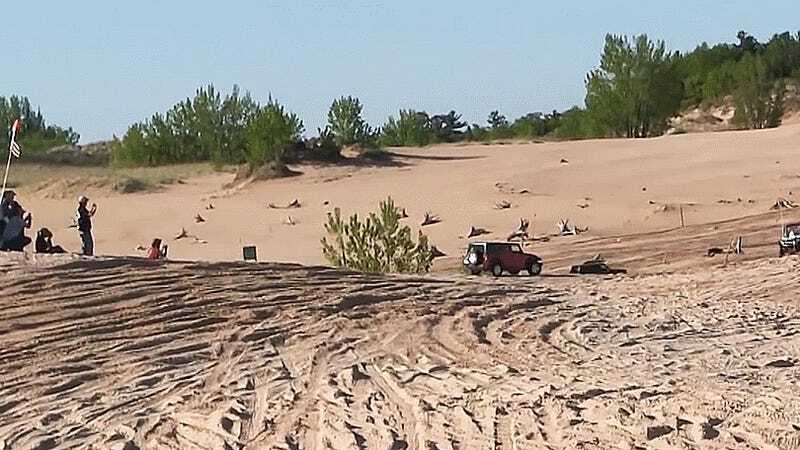 Stock trucks really aren’t made to jump off dunes. Here’s another example of what happens when you try it anyway. While I can commend this driver’s commitment to the jump, no amount of Hemi power can save him from the harsh effects of physics. Worse yet, this truck was a recent purchase for the owner, according to the video description. This Ram 1500 slams to the ground on landing, immediately breaking something in the front suspension and crumpling the driver-side front fender. Ouch! At least this one was a pretty soft landing and the airbags didn’t go off.